So I took apart my c63, thinking I have to replace the throttle body. I open up the intake manifold and find this! I believe it's a piece of plastic from the airfilter? Took it out, put everything back together, car runs better than ever. Whooooaa!!! Holy crap! That's pretty crazy. Obviously it was keeping the throttle open slightly and getting in the way of it opening and closing. Glad it runs better now and problem solved! I'm opening up my intake manifold today for a little cleaning and the installation of phenolic spacers. Will report back if I find anything. You would know if there was a problem lol! It happened after a hard pull. Went into limp mode and threw a p0638 code for the throttle actuator. No matter what i did it would not drive. If I were you, I would check any loose parts that could potentially get sucked in! Also cleaned all the gunk out of the manifold and heads with some gasoline and a rag. Thinking that might have improved performance slightly! Wow, glad that did not make it past the throttle body into the intake runners. I know all engines are different. Does you car have a MAF sensor? If so where the hell was the screen at the sensor? The carbon filters do have a plastic piece that looks like that on either end. Must have broken off when they were removed. If you have removed the carbon filters from the lattice work that holds them in the box top you would understand how it could happen. The MAF sensor is inserted in the airway so that air flows over and under it. 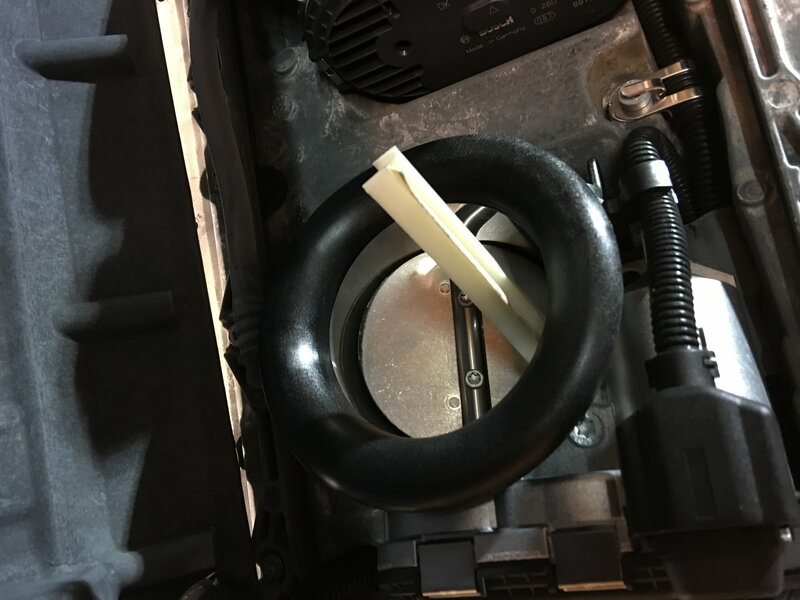 Entirely possible for that piece of plastic to be sucked into the intake past the MAF sensor. Wasn't 100% sure if they were from the carbon filters! They were off the car when I bought it! Bringing up a slightly old thread. When you took the intake mani apart, other than the gasket that goes from the heads to the intake mani, was there any other gasket? I can't seem to find anything. I thought I remembered seeing at least one. If so, does anyone have a part number or a link? Thanks. I believe the only gasket was the one for the heads to the manifold. Alsogonna want to replace the aluminum bolts that hold the intake manifold to the heads. If you are going to take the intake manifold apart, there a couple more of those bolts. Thanks man. And just to clarify, the intake mani is kind of like a clam shell. It's held together with the same type of bolts as the TTY ones for mounting the intake mani to the heads? Or are they a different part number. I've have the manifold off for gasket replacement once before but I didn't take it apart and clean inside. It's got an internal rubber gasket thing that doesn't get replaced, so you don't have to worry about that one. Part number for the little bolts is: MA009 990 30 04 - very expensive for what they are. Probably around $6USD each and there's 13 of em.